← Past News Articles 2007- The cat that got the cream! What’s your favourite Hello Kitty product/item? We all know there is a huge range of different Hello Kitty products on the market, so I’d love to know what your personal favourite is. I’ve spent hours searching the internet for my studies to find weird and wonderful Hello Kitty merchandise. My personal favourite is the Hello Kitty House, it’s bright, kitsch and everything I think Hello Kitty optimises. I love the fact it actually exists! 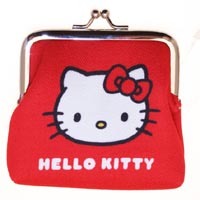 Sadly I don’t have enough pennies to buy my very own Hello Kitty house, so my favourite everyday items are my collection of purses. Over the years, especially while at uni I managed to build quite a collection. I like the fact they are reasonably priced, a nice size and available in lots of different shapes and sizes. Compared to all the random products available on the market I know a purse may seem quite boring or average, but I love the fact I can carry a little bit of Hello Kitty around. It’s not offense as such or in your face, it’s quirky and cute. 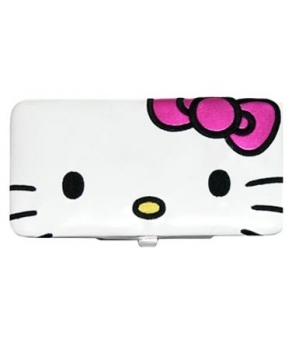 This entry was posted in Hello Kitty, My Hello Kitty Collection and tagged hello kitty coin purses, Hello Kitty products, hello kitty wallets, your hello kitty. Bookmark the permalink.